So similar to my other Top Ten Video Game lists such as my Top 5 Sega Master System games or Top 5 Super NES games , I figured it was time to give a list that was more universally known: Greatest NES games. Growing up, it was my older brother, Dave, who had the NES. It was his, unlike the Master System which belonged to the family. He bought it with his own college boy money about a year after we got the SMS, when it became apparrent that all the Big release games like Castlevania and Mega Man weren’t ever going to be released for the Sega. That being said, I’m cutting this list into two parts. Games 10 through 6 and 5 through 1 later. As I’m sure there are a ton of NES fans out there, I’m eager to hear input on how my list stacks up against others. Ah yes, the Ninja Gaiden series. All time classics in video game story telling, punishing difficulty, and constantly re-spawning angry bird attacks. Seriously with knock back you take from a single stray hit that one of those merciless falcons being enough to send you careening into an empty abyss, forcing you to start the level all over again, it’s enough to make you pull your hair out. I once saw my older brother, Dave, throw an NES controller into a open faced box fan one summer in 1989 as a result of one of those devilish birdies. Believe it or not, the controller survived, it was the box fan that bit it. Good old reliable Nintendo. 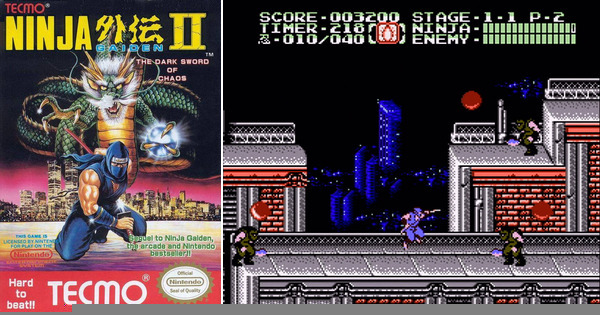 I was torn between whether or not I should be putting Ninja Gaiden or Ninja Gaiden II on this list as they are both great games, but ultimately I selected the sequel. I feel the story is even better in the second one, what with the slowly escalating threat of the creepy uber villain, Ashtar, and more importantly the excellent twist half way through (no I won’t spoil it in case you never got that far). Plus I played the second one a lot more than the first mostly due to the wall crawling instead of wall jumping. Believe me, you need ever extra advantage you can muster to beat this beast. The red clone ninja power is also a definite improvement to Ryu’s arsenal over the first, although it can also be extremely difficult to strategically place them in the heat of battle which somewhat negates their benefit. However I’m sure someone is going to give me sh*t if I don’t mention how infuriating that sideways snow stage is. Like the game wasn’t tough as hell enough, now you have to throw a constantly changing blizzard at me! You know sh*t is real when it snows on an angle. Final Thoughts: Someone should include Ryu Hayabusa in a Hip hop song. Not pony tales or cotton tales…NO! It’s Duck Tales. Woo HOO! Everyone that listens to our podcast or reads anything I’ve written on this blog should know by now I’m a pretty big fan of the “Duck” universe, aka everything that has spawned over the years from the original Carl Banks Donald Duck comics, including the classic Disney afternoon shows “DuckTales” and “Darkwing Duck”. I won’t lie that I was tempted to put Capcom’s Darkwing Duck game on this list given I’m a much bigger fan of that character in general than good ol’ Scroogy, but I’d doing a disservice to this list in doing so. Mainly, because Ducktales is a much more accessible game than Darkwing Duck, and like the TV show, the latter has a lot that it owes to its predecessor in terms of setting the table as it were for any success it might have enjoyed. Ducktales is a fun, kid friendly adventure game with some Metriodvania elements in some of it’s stages (backtracking to find additional secrets). It’s got that classic Capcom style stage selection functionality which allows the player to chart their own course for the most part from game session to game session, allowing for some degree of replayablity. It’s colorful and contains some great sprites as well as some hum worthy tunes. Overall, a lovely game for all ages from 6 to 60. 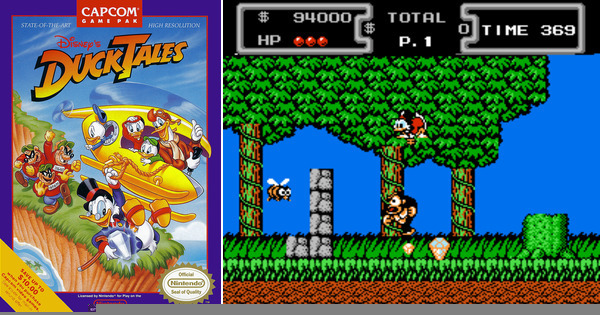 There’s a reason why this game not only spawned an impressive yet largely forgotten sequel in Ducktales 2, a impressive catalog of Disney related Capcom games such the previously mentioned DW as well as an excellent co op on Chip n’ Dale Rescue Rangers, but also was fondly remembered enough to get a HD remake in 2013. My son, Jakob, loves playing that version, so it definitely still has staying power. 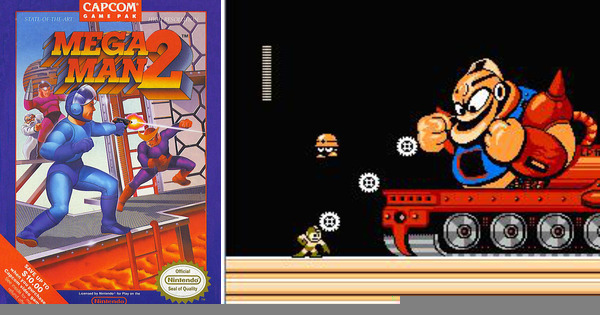 Voted probably the best of the series by NES fans everywhere, I too have fond memories of socking it to Metal Man and using the semi useless Air blaster in this classic from 1988. This game for me beats out the original Mega Man for a couple reasons. First, the introduction of the Energy Tank item which allowed a player to refill Mega Man’s health at any time, really helped ratchet down the frustration I sometime experienced trying to beat Mega Man 1 without making the game too easy. The game also was the first to have those sweet addition items like the rocket sled or the helicopter platforms which for me was a call back to games like Alex Kidd in Miracle World in which you got to neat little gadgets that helped give you additional options when you got stuck. But most importantly, this game introduced is a password system, which is a must have in any game you want players to invest a lot of time in. As a kid that could only play video games for a hour or so, there was no way I could beat a game like Mega Man 2 unless I had this password save to help me pick up where I left off. And as a 4th grader, trust me, even back then I was in it to win it, beating the game was the only end goal. In fact, really the only thing that Mega Man 1 has that’s better is the actual robot masters, as there’s no way Wood Man and Flash Man however cool to look at can beat the iconic look and power set of some of my favorites from the first, like Gutsman or Electoman. This game struck a chord with me so much, that I actually remember buying the novelization. No foolin’. They actually wrote a book based on the game. It was a pretty werid little tale about a kid that is put into a machine or something and wakes up as a robot, Mega Man, himself to be exact. The book then is pretty much a retelling of the video game including the order in which you should beat the robot masters in order to have their weapons be the most effective. Yup, strange little The Matrix meets Official Capcom Strategy Guide book, but hey it made me love this game even more. Ridonkulous! Final Thoughts: The only thing missing from this game was Rush the dog. I was always a fan of Rush. Modern day warrior…and all that. Many of you are probably scratching your heads at this one. Not that it’s on the list, but that it’s not in the top three. I mean it’s universally acclaimed as one of the greatest games of all times and number 3 in terms of sales for the NES (#1 if just count games sold separately from the core system as #1 & 2 were SMB 1 and Duck Hunt). Even my brother, Dave, who has played more games critically than me over the span of his life says this is his all time favorite. What can I say? I did love this game and the insane amount of things you could do in it. I mentioned in my Sega Master System list that the reason I loved Alex Kidd in Miracle World over Super Mario Brothers 1 was that you could do so much more in Miracle World. You had pedalcopters, magic powders, an Excitebike, even a weird blue ball that created little mini clone Alex Kidds briefly. In SMB 1, you had a fire flower….oh and an invincibility star…ummm…yeah. But then Super Mario 3 came out and wow, I finally felt like Mario had caught up to that first Alex Kidd with all these neat items to give you more options in game play. From Frog suits, to raccoon tails, to…fire flowers…and invincibility stars. Ok, well at least they gave some cool new swag to spice up the traditional side scrolling hullaballo, and for that just like everyone else in America I wolfed down this latest Mario sandwich with a side of Luigi fries. But, again, Why is this game so low in my top 10? Well I guess I can sum it up by saying: World 8 was just so incredibly hard. I mean, unforgiving, relentless, soul crushingly hard. And especially as a young kid that lacked the years of muscle memory built up by playing other games, it was like hitting an unbreakable wall hard. I still have nightmares about that last pirate ship…man…it makes me want to breath hard into a paper bag to stop from hyperventilating. Long story short, I never beat this game as a result…and that sits sour in my mouth. I often times curse those games I could never beat and like ex girlfriends that did the dumping, they will always have a twinge of hatred wrapped up in any good memories I might have. Plus, you had to wait so long to get the Hammer Brothers suit. Everyone knows that suit was the best weapon Mario ever had. Final Thoughts: I was a huge fan of the Mario Brothers mini game that was included in the game. It was like I paid for Mario 3 and and got an Arcade game for free. That’s a win win. My little brother, Ethan, and I played that a ton when we were kids. 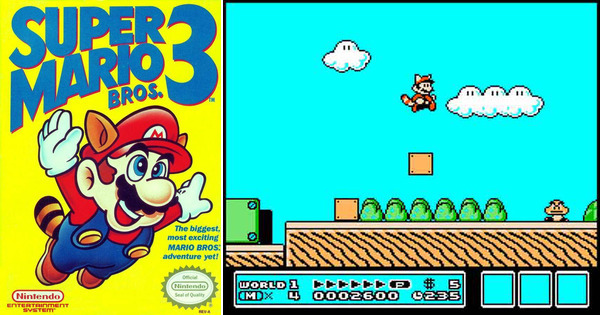 Sometimes more than Mario 3 itself. YES! Still rawk this game hard some 25 years out! Seriously, this is actually one of those games I constantly go back to mainly as a stress reliever in my old age. Some peeps play Tetris, others those Candy Crush type games. Me? I just like beating the tar out of Von Kaiser with a barrage of 3 super star punches to put his mustachioed kraut keister on the mat. Keister, Kaiser, Keister, Kaiser. That’s fun to say. It’s pretty much perfect in its gameplay and design with names and strategies we all memorized after reading Nintendo Power. I sometimes challenge my other gamer friends to a contest to see how far you can get in the game without getting put on the canvas once. Usually for me, its around the Major Circuit’s Title Bout against Bald Bull, just because he is somewhat of the turning point in the game, when the cheap tricks start running out and it’s all based on timing and skill from that point on. Still, this game is lower on the list because I never beat it. It’s crushingly hard in those last matches on the Word circuit, starting with that second time you have to fight Don Flamenco. Like that World 8 of Super Mario 3, Don Flamenco rules over my own inner circle of video game hell. 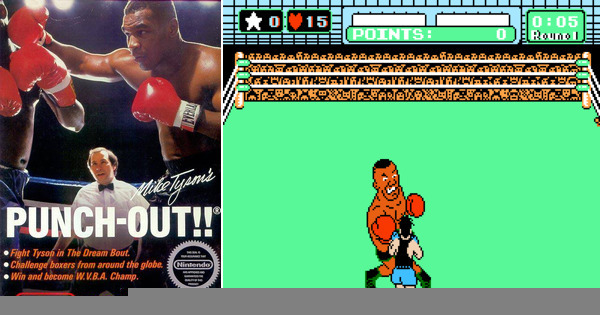 Plus, I never actually got to experience the Mike Tyson version of this game, as by the time I got it, he was replaced with Mr. Dream and it was just called Punch Out. Despite a resurgence in popularity of Mike Tyson as well, this version is still the only licensed one you can get on any of their Virtual Console stores. I mean, I get it, you don’t want to pay Tyson. It’s a straight up business decision. Still a bummer for the rest of us. It’s like having Tecmo Bowl and no Bo Jackson. Final Thoughts: Soda Popinski is probably my favorite fighter in that game. Wish they would have called him by his original name Vodka Drunkenski. Then he would have been my Absolute favorite fighter. Get it? Absolute? Vodka? He likes the drinking…oh whatever. If you too were a fan of this list, Let us know your thoughts and stories! If you’ve never played it, I’d highly recommend River City Ransom. It’s like a Double Dragon rpg (which I think they did with Double Dragon 2, but not as good). Oh Heck yes! River City is an often overlooked gem! I think it’s actually the best “Beat ’em up” on the NES console. If I had a top 20 list, it would definitely be on there! Good Call!